The kitsch Cameron Highlands: touristy as anything, but deservedly so. It’s been 19 days since I stepped off the bridge connecting Singapore and Malaysia and took my first steps on the Eurasian mainland. Those were my first moments in this one great shared landmass that I won't step foot off until I board a ferry in Calais, France. Now, sitting here in a sweaty Bangkok loft in my hostel after a few days of administrative pause, I’m desperately looking forward to pressing on towards that distant corner of Europe, and leaving South East Asia in the rear view mirror. South East Asia, broadly speaking and despite its diversity, has never resonated with me as a destination. Apart from brief sojourns to Singapore, Cambodia and Vietnam several years ago, my travel priorities have always been elsewhere, further from home. I’m not entirely sure why. Perhaps it is the region’s backpacker reputation: though I’m 27 I feel like a traveller twice my age sometimes, and the nightlife in this part of the world doesn’t really excite me. I enjoy the solitude of an independent adventure. I tend to sleep at reasonable hours and rise early to explore my locations on foot before the heat reaches its apogee, rather than sleeping through those hours escaping hangovers. Drinking is too expensive to do in any great quantities (yes - even in South East Asia! ), anyway, particulalry when you’re on an oppressively tight budget such as mine. Often, especially when passing through these big, monotonous cities, I seek respite in the air conditioned comforts of local cafes to further explore the world through my kindle. Usually, when I look around, I’m surrounded by grey haired 50-somethings doing the same. So the temptations offered by Kho Samui or Phuket have never drawn me here. But, this trip and its preposterous overland route being what it is, I was always going to have to spend at least two months inching my way through this part of the world. And, while I'm of course glad I did, the greener pastures further north have never seemed more appealing. I spent my first night in Eurasia - contemplating the 14,000 kilometers of land ahead of me - in Johor, the utilitarian port city next to the Singapore border, before enjoying the extraordinary modernity of Malaysian coach travel on the way to Melaka the next day. I’ll admit to having close to no interest in Malaysia previously. The only reason for this is my utter ignorance in the country. So, going in blind, Melaka proved to be a joy - its colonial era architecture and laid back pace was enticing, particularly after the frantic nature of my Indonesian travel those previous weeks. There, I spent my time in a small hostel talking about Canadian oil-drilling with a guy from Calgary who’d made it his life’s work. I ate well and slept well. The otherworldly landscapes of the Bahrat Tea Fields, in Malaysia's Cameron Highlands. Then, after a rapid 24 hours in transit in Kuala Lumpur, I headed straight out of the big city to the Cameron Highlands for three of the most enjoyable days of the trip. The Camerons are not off the beaten path: they’re teeming with tourists. Sometimes this is annoying, but only in my eyes when the place’s popularity is totally unjustified (ahem...Kuta). But the Camerons popularity is justified. Its kitsch, I’ll grant you that. While modeling themselves on Cumbrian hillside towns, in reality the villas are low quality 1970’s structures with cheap facades. But the nature is joyous - there are dozens of hiking trails around, which are usually completely empty. 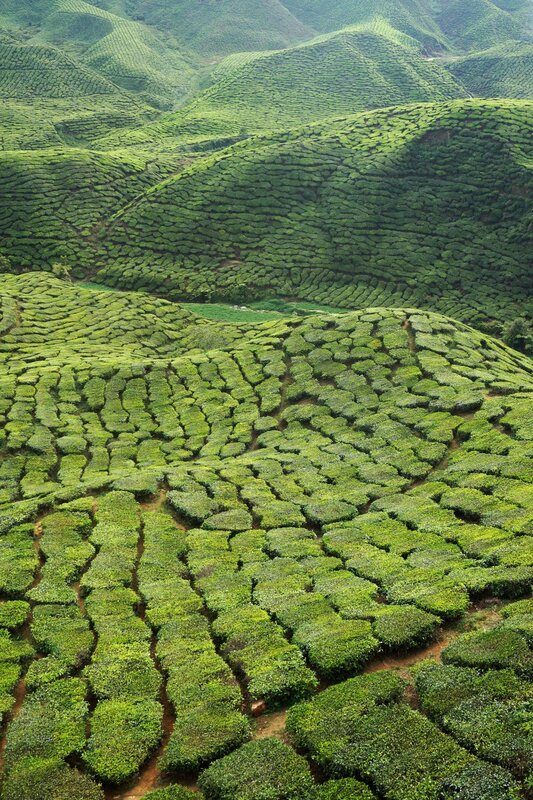 And of course, there are the tea fields, which cast an otherworldly presence over the region. The only thing to dislike about the Camerons is the ferocious wild dogs. Three times I was chased by packs of these mongrels - one came so close to sinking its teeth in that I guilty admit to having kicked it in the snout with my boot. I felt bad, but its teeth were literally gnawing at my laces and threatening my exposed shins. The Camerons were populated enough, but I had no interest in trying to find a rabies shot in its small towns. So, with the hound cowering in agony, I ran back to town, away from the trail and the not so friendly pooches. In the wake of my days on the trails, I moved further east, to Terengganu - an unexciting town, it must be said - and Pulau Bidong on the peninsula’s northeast coast. In Terengganu I met a prison guard from Dresden, who kept me captivated with his tales of a working life behind bars. He recited stories about his maximum security inmates, which include Germany's worst mass murderer in the post war era - a monster that is responsible for the deaths of over 100 people. Traveling to Pulau Bidong, a tiny island that once played host to up to 60,000 refugees at one time, was a moving experience. You can read more about my visit here. From Bidong, it was time to head north to Thailand, via a short pitsop in Georgetown, Penang. Skipping the war-torn provinces of Narathiwat, Yala and Pattani, I crossed into Thailand through Songhkla province, heading to the city of Hat Yai. On the Do Not Travel list thanks to the perpetual violence just down the road, I was hesitant at first about traveling through this province at all, and particularly across the border. But it was welcoming, easy, comfortable, and safe. It was boring, actually. I’d heard horror stories about crossing Thailand’s land border. But my experience literally could not have been any easier. After filling out my immigration card, I presented myself to an agent who was enjoying the birthday cake her colleagues had just handed her as I waited for my turn to be processed. It's easy to stereotype border guards. They can be assertive and strict and mean and intimidating. I’d had my own run in crossing into Indonesia, and was wary. But here was the guard, concentrating more on a delicious looking slice of chocolate cake than her task at hand, unable to wipe the smile of her face as she stamped me into Thailand. She actually granted me a 30 day stay as opposed to the 15 days required for Australians entering at land borders. Must have been good cake. Itching to get to China, my stay in Hat Yai was brief. But I did take up a Polish bikepacker, Maceac, on his offer to join him as he rode to Songkhla City, before darting straight up to the Bangkok for the beginning of a busy working week chasing visas. I boarded a 3rd class, seated overnight train in Hat Yai to Bangkok. I love train travel. But this tested my patience. The seats were smaller than a plane, my seat-mate slept on my shoulders, and the only food on offer was a packet of processed satayed mackerels. With scant air-conditioning, third class is a grim, sweaty nightmare. The consolation would be my window seat views, right? Wrong. The window was complete hazed over, so opaque as to make any view impossible. A sleepless night was assured by the deathly, unending cough of the poor person behind me. By the earth-shattering volume of his guttural, gurgly splutters, it seemed that sickly man hadn't long left on this earth. So, now I'm in Bangkok - yet another samey South East Asian megacity - having secured my Chinese visa while still waiting on my Mongolian one. 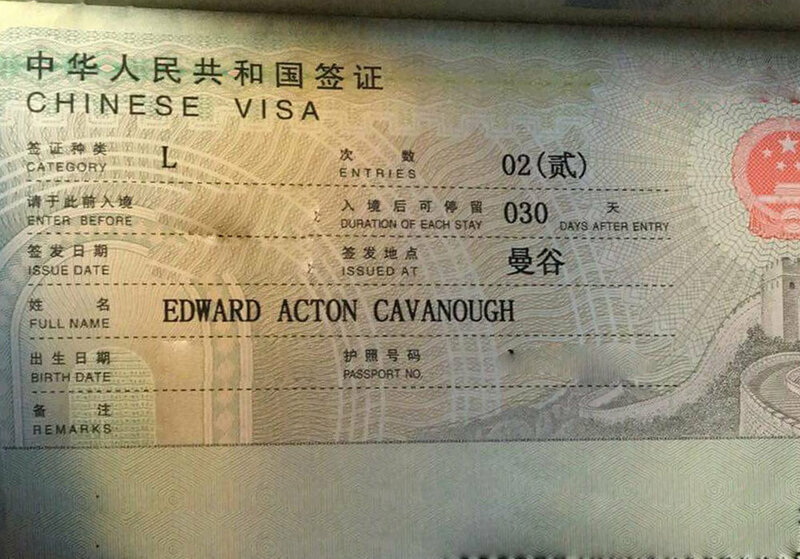 Getting a Chinese visa in Bangkok was extremely straightforward. The Mongolian visa is a more old-fashioned process that requires time, and patience. Over the coming week, with my visas secure, I’ll cross the Laotian border by boat, and race through the country to China. I’m sure there is much to see in Laos. But I want to press north, and I want to press north fast. Beyond Laos lie lands I’ve dreamed of visiting since childhood. It will be harder and more different and further from Australia’s (and Australians') extensive orbit. The hillsides of southern China and the great Eurasian steppe of Mongolia, Siberia and Kazakhstan are near. After 8000 over land kilometres, crossing the border into Yunnan and leaving South East Asia behind will mark a new beginning. The Chinese frontier can’t come quick enough. Waiting, waiting, waiting in Bangkok.